Since I've been living here in London there are two questions that people ask me - all. the. time. Both of which I'm rather sick of answering so I've started to give weird and wacky responses just to give myself a laugh. For those of you wondering what the questions are, here are the repetitive pondering's of every stranger I meet... "Why did you move here to London?" And "do you miss home?" Truthfully the answer to the first question is a little lengthy but essentially it's along the lines of "I always wanted to live overseas, there's more career opportunity here and I love big cities." The answer to the second question is a lot more succinct: "no". Having a car. Not so much for the purposes of driving around but so that I have somewhere to sing as loudly as I like. I used to get such satisfaction from playing Adele and belting out Chasing Pavements knowing no one could hear me. If I were to attempt that on my tube commute I think I might end up being escorted to the looney bin. My piano. I hope I've still got my skills next time I find somewhere to play. I may need to pose as a music student and sneak into a college. Australian biscuits. Would you believe that the UK, renowned land of "tea and a biscuit", actually has a pretty terrible selection - what I wouldn't give for a Mint Slice. Moisture-rich skin. I don't know if it's the cold weather, the hard water or the lethal combination of both, but my skin is dryer than the Sahara. I've got to the stage where I'm drowning myself in baby oil and still not getting anywhere... Help. Searing hot sunshine and the beach. Need I say more? Australian prices. What I wouldn't give to go back to paying $14 for a cocktail. I used to think that was expensive but I know better now when a London vodka lime soda costs me £13, i.e., $24. Ouch. I may be bold and brash on the rare occasion, but for the most part I think I'm definitely a delicate and dainty girl - a taste for the finer things, feminine style and a kind spirit all come with the territory. How we dress most certainly reflects our personality and I for one think I am a true representation; fashion wise - what you see is what you get. For me this equals creamy palettes, flowing shapes, high heels and delicate jewels. Living here in Europe has really complimented my style - there are so many different brands here to cater to your look. Honestly the choices are endless [don't tell anyone but is it sacrilege to say I think there's too many!?]. That's why when I come across one I truly like I get a warm fuzzy [stylish] feeling. Meet my latest style crush - TIMI Accessories. Say hello to delicate jewels, whimsical designs and the integration of one of my true loves - animals. I'm in raptures over these two little neck pieces - perfect for autumn style. The squirrel is in the acorn - isn't that the cutest thing? You'll find me squirrelling away in the London autumn leaves. This was a sponsored post courtesy of TIMI Accessories. I had the pleasure of attending a splendid blogger event in London this week, organised by the lovely girls over at Blogger Hub. When an invitation came round offering a tiki themed bar location, beauty brands in attendance, a fashion parade and cupcake decorating I thought how can I resist!? I’m so glad I attended because I came across some lovely brands, people and fellow bloggers that I probably wouldn’t otherwise cross paths with in this crazy London world. 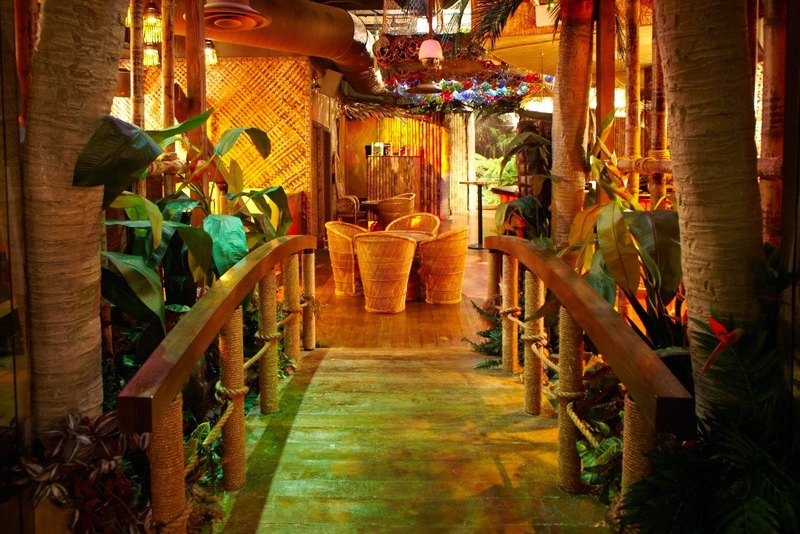 As you can probably tell by my photos I was a little obsessed with the tiki tiki [it has to be said twice] location – Kanaloa’s Hawaiian cocktails were deeeelicious. Matthew Calvin jewellery - this talented designer makes all the creations himself. With urban edgy, individual designs it's true craftsmanship. Sumayah Deria - This young designer boasts some beautiful feminine designs; think lashings of lace and flippy skirts. Sniffy Wiffy beauty products - not only do these creams smell delicious but they come with a good premise - promoting breast and testicular cancer awareness. Do your self checks everybody. Bow Boutique - had the perfect collection of party dresses. Check them out on your next search for Saturday night's outfit. Ndulge Creams - had some delightfully indulgent homemade blends of creams and exfoliants. Hello baby soft skin. Umberto Giannini - these guys were onsite to offer hair tips and make-overs. I nabbed myself some much-needed hair oil which has totally indulged my very dry locks. Hifas da Terra - chocolate made from mushrooms, who woulda thunk it? Hello same delicious taste with bonus health benefits. I think there are two kinds of people in this world: those who look forward to the Christmas break to have a few days off work and share a meal with family and friends, and those who are breaking out the tinsel in November, planning festive get-togethers and running around like a little elf in December. I definitely fall into the latter category. I. love. Christmas. I think the festivity that this time of year brings is so wonderful - cities light up with decorations, pop-up events appear everywhere and there is a generally jolly spirit around. Being in London for the Christmas season this year is even more exciting for me - with the cold climate here, the holiday season is even more wonderful. 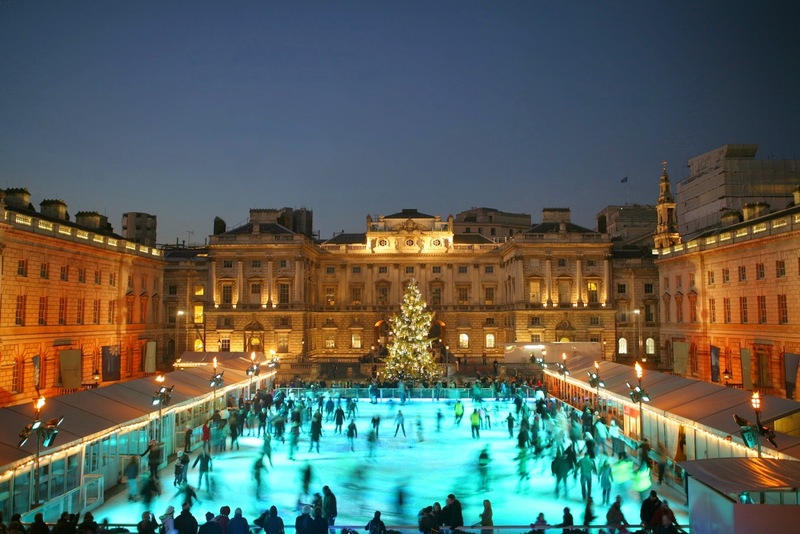 Here are some of the festive attractions on in London that I can't wait to see. Transforming the city's largest park into a real life Winter Wonderland? Thank you London - I'm in heaven. 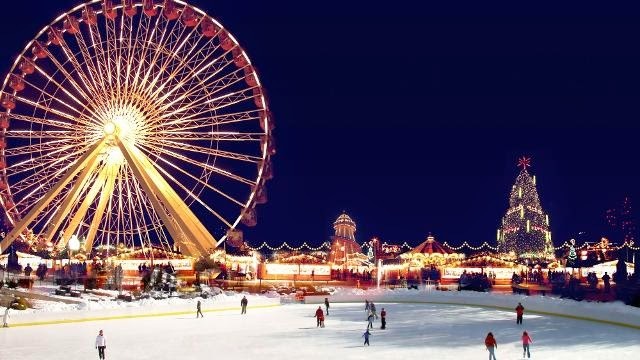 Complete with an ice-skating rink, ferris wheel, rides and Christmas market stalls this has to be the largest event in the city. It opens next weekend... you know where to find me. Probably the most picturesque rink in the city, this is definitely one to check off your bucket list. This 18th century courtyard is an idyllic location to carve up the ice under the twinkling lights of a giant Christmas tree. London's department stores go "all out" with their decorations each year. 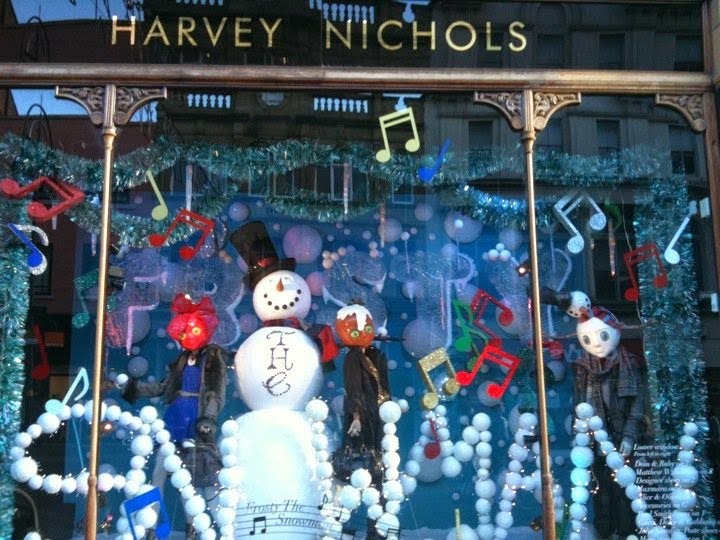 Harvey Nichols is renowned for its beautiful window displays but don't discount others like Harrods with some beautiful windows as well and Selfridges who have a delightful "Christmas Grotto". A walk down Oxford Street and Regent Street is also well worth it with their light displays. 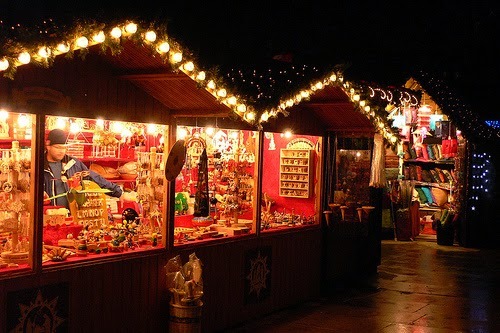 You don't have to venture as far as Germany to see some Christmas markets - London has their own little German village at Southbank on the river. Here you can feast on all the classics like mulled wine, bratwurst sausages and dutch pancakes. 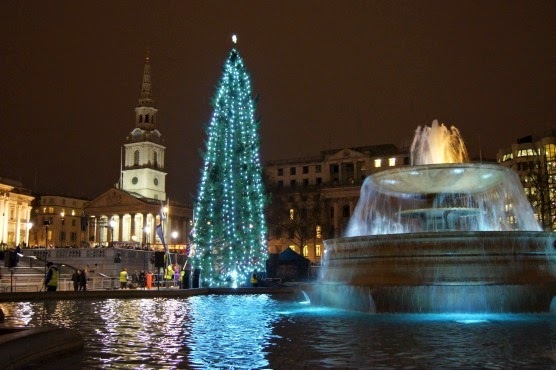 And if you love carols as much as I do Trafalgar Square has its very own session from 8th - 23rd December. Set in the square under the world famous tree you can sing deck the halls to your heart's content. And just to top it all off nicely, I'm off to visit the quaint little Bruges Christmas market's in Belgium in a few weeks. I'll be sure to share my weekend with you. Last weekend saw me head off to the most northern part of the world that I have ever ventured – Edinburgh. With a suitcase laden with coats and gilets I felt prepared for the chilly Scottish autumn I was about to encounter, and they were right – it sure was cold and the blustery wind and rain makes it feel even chillier! Nevertheless I had a wonderful weekend soaking up the sights [and several hot toddy’s] in this historic town. Every little part of Edinburgh lives and breathes its historic background – the town just oozes old-world charm. The most stunning sight that evidences the town’s age is Edinburgh Castle which sits right in the centre of town way up atop an extinct volcano – it’s a pretty incredible location. The battlement is first mentioned in literary texts back in the 10th century but they believe it dates right back to 600 A.D. Amazing. Leading up to the castle you’ll find the Royal Mile which is a historic cobblestoned road that features some of the iconic places of Edinburgh’s Old Town. All around this area you’ll find truly charming residences, awe-inspiring churches and original cobblestoned paths [watch out for these, I tripped several times!]. Further downtown you’ll find Princes Street which is the main shopping mall of Edinburgh, along here you’ll also find the Balmoral which is a beautiful stately hotel. One street further up is George Street where there is a great selection of dining options – this is also where you’ll find The Dome. What was once the headquarters of the Scottish banks, this historic building now houses a beautiful selection of dining options and their Christmas decorations are first class – complete with fake snow [don’t tell anyone but I actually thought it was real and got very excited!]. And if you’ve got time and feel like stretching your legs a walk down the Water of Leith walkway makes for a lovely stroll. This little river heads up towards the ocean from the centre of town with plenty of beautiful buildings, charming bridges and cosy pubs along the way. Edinburgh itself is actually quite small so within the town you can easily walk around and take in the sights – I think it’s the best way. But if you need to get out of the rain or travel a bit further afield to the outskirts there are buses, trams and taxis at your disposal. 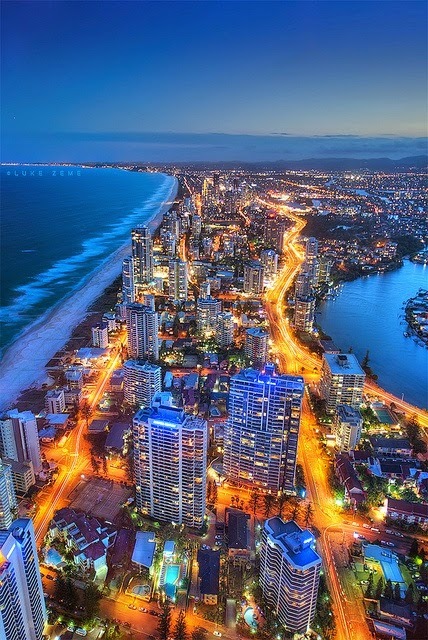 When arriving in from the airport you can easily get the tram or the Airlink bus straight into the city. Food and drink seems to be a huge part of Scottish culture – I think it’s largely because the weather is so often cold and raining, so settling down in a pub with a hot roast and cold larger must seem like a pretty good option for locals. I had the pleasure of eating at some lovely places during my visit. Peter’s Yard which is a Swedish café makes a great breakfast stop – I can highly recommend their breakfast tray which provides a delightful assortment to get your day started. Grass Market in the Old Town is a strip of old style venues with several low key pubs that have a very authentic feel. If you fancy a trip to the markets, the Stockbridge markets have some great produce available and make a lovely activity for a lazy Sunday. And for a lovely meal for dinner you can’t go past The Grain Store in the Old Town. This beautiful restaurant offers an idyllic, authentic atmosphere (think stone walls and candelabras) with some truly incredible food; I highly recommend the scallops, partridge and chocolate fondue. This wee lassie had a grand old time in Edinburgh - this historic town makes a wonderful place for a weekend visit - just be sure to pack your best coat in winter and some very good listening skills to decipher the Scotsmen. Style It. Walking in an autumn wonderland? Everyone knows about London’s winter chill, but no one ever warned me about the autumn one. Here we are it’s barely November and the other morning I woke up to read my phone telling me it was a frigid 0 degrees. I’m sorry what? No wonder I had a shock when I woke from a dream about balmy Hawaiian beaches to a very chilly bedroom. I’m all a bit confused really. I mean I was in Milan the other weekend which is right near the alps but that was lovely sunshine and warm days [I wished I’d packed a t-shirt]. Then on the other hand I was in Edinburgh this weekend where there was a low of 2. I speak to my mum each morning in Australia where she is telling me what a lovely day it is and that it’s 30+ degrees. I get lulled into a false sense of security after our chats because I step outside here and get a bit of a fright. Thank goodness there is a bit of a trade-off since Christmas is on its way and the city’s decorations have started to appear. I think I can handle the chill if it means having some snowy festive days, mulled wine, Hyde Park’s Winter Wonderland and roast feasts. When it comes to European travel, Italy has always been at the top of my list. A country filled with pizza, pasta, gelato, breath-taking coastlines, iconic historical buildings and postcard-worthy beaches ranks very highly with me; not to mention that my grandfather came from there. It has always been my intention to do Italy in one big chunk so I can truly immerse myself in the country – I’m talking hiring a car and driving around for 3 months. But now that I’m so close, being here in London, I thought I ought to pop over there to whet my appetite. It was a big choice deciding where to go for my first visit to Italian soil, it needed to be somewhere I could do in a weekend and somewhere that I would enjoy even though I was by myself – Milan was the perfect choice. My two-day adventure was just wonderful – full of delicious food, spectacular sights, beautiful back-alley streets and of course some world class shopping. When you say Milan the first thing that comes to mind for most people would be fashion, the second thing would be the Duomo di Milano which is the incredible gothic cathedral that sits in the centre of the city. I was super excited to see both, but what I didn’t bank on is how lovely the streets of the city are as well, making them a sight all of their own. I must say I have completely fallen in love with the Fashion District of Milan – be sure to walk down Via Della Spiga for the designer brands like Lanvin, Tiffanys and Dior, Via Monte Napoleone has a similar collection and Piazza del Duomo is great for high street brands. Via Della Spiga was probably my favourite place in Milan, in two days I think I walked up and down it four times – it is such a beautiful little alleyway with such character, not to mention beautiful shops. Milan’s icon, the Duomo di Milano, truly is a sight to see and shouldn’t be missed. The enormity of it is evident when you walk the aisles inside, and for a small fee you can climb up to the roof which I highly recommend. The detail in the gothic architecture is awe-inspiring and there are even gargoyles. I got some beautiful photos up top and the bird’s eye view really puts the city in perspective. Make sure you also walk over to Parco Sempione; this beautiful park is a haven for Milan. The grounds are lovely with various trees, waterways and bridges, and there is even a historic castle which is well worth a walk around. The Galleria Vittorio Emanuele II is a breathtaking piece of architecture that you shouldn’t miss. Home to the likes of Chanel and Prada, it features an incredible design complete with huge glass domed roofs. Just over the road is La Rinascente, a large department store – its food hall on the 7th floor offers some wonderful treats and the Moet Champagne Bar deck has a beautiful view of the cathedral. You can cheers to your climb with a glass of bubbles. My one recommendation for getting around Milan would be to walk, walk, walk. Honestly you see so much more. The majority of sights are in and around the city centre so you can easily spend the day on foot. I really enjoyed taking zig zagging routes where I would come across beautiful cobblestoned alleyways full of little shops and shuttered apartment buildings. There are also plenty of buskers around [who are very good!] so you’re sure to have a musical journey. If walking isn’t for you there is a rather simple metro system like that of Paris that you can use, and also cabs are relatively cheap. When arriving in Milan I would recommend flying into Linate Airport if you can, it is much closer than Malpensa; 15mins by cab as versus an hour. Ahhhh Italy and its food – I was in heaven for two days. So much pizza, pasta and gelato and it truly is delicious. Number one on my list has to be Spontini for a pizza slice at lunch. Located in a back street near the cathedral, there is nothing glamorous about this place, it’s just a huge slice of pizza on a paper plate, but it is the best pizza I’ve had in my life. Ever. The queue round the block shows that everyone agrees and it’s well worth the wait. Also just on a street nearby you’ll find Luini Panzerotti – again the queue is all the way down the street but these little doughy, cheesy-filled bread scrolls make a delicious lunchtime snack. Gelaterias are on every corner and from what I tried they are all equally good with lovely crisp cones and creamy flavours. When it comes to dinner there are so many restaurants to try I can’t possibly advise when I only had one meal – I opted for a family-style Italian place that was homey but there are plenty of ritzy options too. I can’t tell you what a lovely little weekend I had in Milan. It really was the perfect place for a single girl's weekend adventure. I left with a sated stomach, an inspired mind and a phone full of selfies. Who doesn't love Halloween? It's the only day of the year that you can see vampires, zombies, bloodied nurses, dead celebrities or skeletons walking down the street and think it's completely normal. On my way home from work on Friday I passed Marilyn Monroe, Dr Jekyll and someone in a dressing gown, slippers and hair rollers - I didn't bat an eyelash. On account of the fact that I spent the weekend in Milan (travel post up soon) I had to have my Halloween celebrations a little early on Thursday night. After much debate about my costume I decided simple was best - I was going to go as "dead". When I told my mum my choice she expressed her horror and said why couldn't I go as something "alive". Clearly she missed the entire concept of Halloween somewhere along the line [bless her little cotton socks]. I had a grand old time doing my make up - there's something so satisfying about going out looking ugly and dishevelled on purpose. Honestly I wish I could do it more often. I did my make-up with some white paint, a whole lot of eyebrow pencil, eyeliner and of course fake blood. Tada!